It doesn’t take a $80k warmblood import to excel at the sport. Morgane Schmidt seeks advice and input from the riders of five “unorthodox” dressage horses. Dressage is a sport often considered reserved for Warmbloods and other similarly purpose-bred horses. While it is true that these horses tend to excel at the discipline—I mean, wouldn’t you hope they would since they were bred for it?—it’s silly to think you can’t successfully compete with a horse of almost any breed and have a fabulous time doing it! While gaits are certainly a large part of the judging criteria, correct systemic training is arguably an even greater component and as such indicative of the fact that you don’t need an Olympic quality mount to succeed. Morgane and Stormy. Photo by Tamara Torti of Tamara with the Camera. ..I can wholeheartedly attest to this and I am certainly not alone. There are plenty of professionals and amateurs both bringing non-traditional partners into the dressage ring and up the levels. What follows are some insights and tips from a few of these riders regarding their personal experiences in the ring. Seana Adamson is a USDF Gold medalist as well as a Sports Psychologist (check out her brand new HN column, “Ask the Equishrink“). Before turning her focus to dressage she was a successful eventer at the Intermediate Level. Winter Prince was a 15.1hh AQHA gelding that Seana competed through the preliminary level in eventing (which while not straight dressage certainly has a dressage component). She and Winter Prince also completed the Essex Three Day event, finishing in 10th place. It can be great fun to ride something “different.” It takes the emphasis off of trying to be brilliant and puts the emphasis where it belongs, attempting to be steady and correct. While most judging is pretty fair, some judges are not super sympathetic that the little Quarter Horse in front of them cannot physically present the same uphill neck position that the fancy warmbloods can do so easily. Often judges seem to have a fairly low expectation of the non-traditional dressage horse trotting around in front of them. So if you can show a correct and happy picture then they seem to be pleasantly surprised. Then there is nowhere to go but up! Conversely, when you show up on a super fancy moving warmblood, if there are problems the judges can be very critical (as they should be), and then there is no where to go but down. So sometimes riding a non-traditional dressage horse can be a benefit by playing with the judge’s expectations. Non-traditional dressage horses will teach you how to squeak every last bit of movement out of your horse. If you can learn to do this, then the amount of movement you can achieve with a big moving warmblood will amaze you. This can become a huge benefit to you as a rider. That being said, stay aware of your horse’s physical limitations and recognize when the horse has reached the limit of their ability. This goes for any dressage horse, traditional or non-traditional. Honor the personality of your nontraditional horse. If your short-legged palomino pony is sweet, charming, and fun then demonstrate that in the ring, don’t try for spectacular, leggy and elegant. Have a spotless turn out so that the judge sees you are taking the process seriously. In the end, so few of us will ever grace the cover of a glossy magazine or represent our country on an Olympic team, so find a horse you enjoy riding and go for it! Lesley Grove is a USDF Bronze and Silver medalist who successfully trained and competed True Texas Colors (Blue) from training to I-1. True Texas Colors is a 15.2hh, 2000 APHA gelding who has won multiple CDS championships and has been the USDF All-Breed Champion at both PSG and I-1. Overall my experience has been very good. There have only been one or two judges out of all that I have shown under that have shown any real bias against my horse. Generally the judging has been very fair and it has been a true joy to spend 10 years taking my Paint to FEI levels and competing successfully. You have to spend a lot of time developing the actual gaits. I spent at least two years developing a trot and most of my warm-ups were spent finding that trot. Also, they can be a little slower to learn the flying changes etc as they are not as naturally inclined to that kind of energy. The main benefit of riding a non-traditional breed is that you must train correctly. You cannot get through any stage of your competing without making every point count and to do that you must have a well trained horse with no holes. The training and correctness of the work are what will get the points in the end. It is also extremely nice to ride a horse that is never hot, bothered, or nervous and who has a wonderful work ethic. Blue has been the star of the show to the spectators who have followed his career and always knew who he is. He has also been an inspiration to people who have a non-traditional breed and really had no idea you could take an average horse to the FEI levels. Never ever think “we did well for a Paint (or what ever breed you are riding).” Non-traditional breeds can excel because of the other qualities they bring to the table. Never limit yourself. Concentrate on the basics. A halt is a halt. A rein back is a rein back. A turn on the haunches is a turn on the haunches. There are lots and lots of scores that are not influenced by the gaits. The higher you go through the levels the easier it is for you to shine on a correctly trained non-traditional breed. You don’t need a warmblood to ride FEI levels. Above all else ride a horse you enjoy getting on every day. Sarah Silva is a USDF Gold Medalist who has trained Camillawood since age four and brought her through the levels to Grand Prix. Camillawood is a 1996 Percheron/Thoroughbred cross mare. Overall my experience competing a non-traditional breed has been positive. Although I have encountered some breed bias a few times over the years, for the most part I have felt that the judging has been completely fair. Additionally, as I have moved into the FEI levels, I have had many people come up to me and comment on how cool they think it is that I am riding a non-warmblood at a higher level. I definitely think there are unique challenges to showing a non-traditional breed, in my particular case my mare lacks natural suspension. In order to progress into the upper levels I have had to really work hard to improve her gaits in order to stay competitive in the show ring. Although all horses are going to have some challenges to overcome when training upper levels, when you are starting with a horse who was not necessarily bred for the sport, the work (which is already difficult) becomes even harder. I think that when you are showing (and training) an uncommon breed it really helps you as a rider learn to develop your horse’s gaits. You also may encounter more issues in some of the more difficult movements, which can actually help you come up with some creative solutions. I would say that if you are competing a non-traditional horse try to play to their strengths in the ring. If your horse is super at collection, aim to make moves like your pirouettes excellent, that way if some of your other work isn’t perfect you can make up for it with your horse’s strengths. Also try to keep in perspective what your horse’s limitations are and remember that you are only competing with yourself. Try not to get discouraged if you are not scoring as highly as some of the flashier horses are and focus on how your horse is improving or what you could be improving upon. Photo by Tamara Torti of Tamara with the Camera. Stacey Taul is a USDF Bronze and Silver medalist who has done all the training on Comandr-N-Chief herself. Comandr-N-Chief is a 1996 Arabian gelding. Prior to focusing on dressage, Stacy and Comandr-N-Chief showed on the Arabian show circuit in hunter pleasure. Currently the pair are showing I-1 with an aim towards I-2 this year. 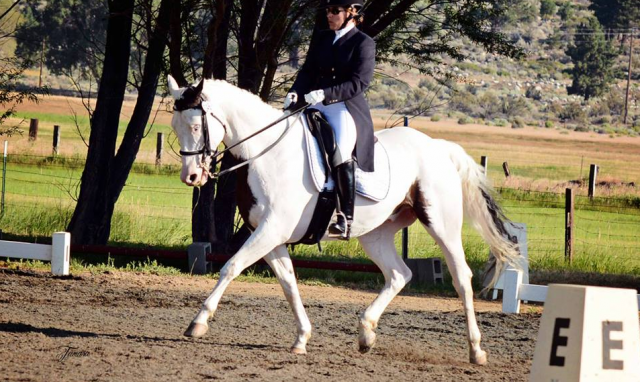 I have had very positive experiences since starting dressage in 2006. I have never felt like I was at a disadvantage on my horses since that time. I personally feel there is no specific challenge showing an Arabian in open dressage shows, although I do feel like you have to hands down be on your best game at large open shows. More challenging than his breed is being an amateur that trains my own horse. For me, personally, the benefit is showing the amazing ability of a non-traditional breed in the dressage arena. The Arabian horse is a breed that is very in tune with their owner and is actually a great size that makes them more manageable for the average amateur. Put great effort in your basics to show your horse to the best of your ability. Back in the ’90s I did get comments about my Arabian by dressage judges but these days my horses and I have been judged honestly on our ability and the ride we gave that day, not on their genetics. Rachel Wade is a USDF Bronze and Silver Medalist who trains in Sacramento, CA. Peperooga’s Parnoo Ori (Ori) is a 2006 Gypsy Vanner mare owned by Sara Bartholomew. Rachel and Ori made their debut this January at fourth level with an aim towards PSG later this year. Overall the experience is a positive one. Luckily for me Ori has three very good, functional gaits along with a very good hind leg that I believe sometimes take judges and spectators by surprise. While I know that there are people who feel that certain judges are biased against non-traditional breeds I have found that when we put in a good solid test we can score and remain competitive showing in the open divisions. We have good and bad days just like everyone. One of the biggest benefits of showing a non-traditional horse like Ori is that she does attract a lot of attention and people tend to remember her! We do receive a lot of support from the breed [registry] as well as from others with non-traditional breeds that are happy to see her continue to move up the levels and continue to do well. This definitely gives people the support they need to pursue their dressage career on their non-traditional horse. Riding your horse for yourself each time and not for a score will help you become successful. Set goals for you and your horse that you feel you can reach and don’t worry about getting an “8” on gaits. You can still get 8’s or even higher if the movement is ridden and executed correctly. For me it goes to show that three functional gaits, no matter what the breed, and a willing character are what you need for a successful partner. Go Showing (with your non-traditional breed)!